Have you ever heard kimchi called “Nabak Kimchi“? 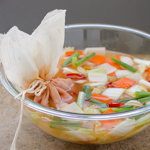 It is a watery kimchi with cabbage and radish mingled in delicious yet pungent kimchi broth. This is the kimchi that doesn’t use any fish sauce or any fish product, so you can serve to your vegan friends or people with seafood allergy. It is also very mild in spiciness so even the young children who are not accustomed to the spiciness can enjoy the goodness of kimchi. The word “nabak (나박)” comes from the shape of sliced cabbage and radish. 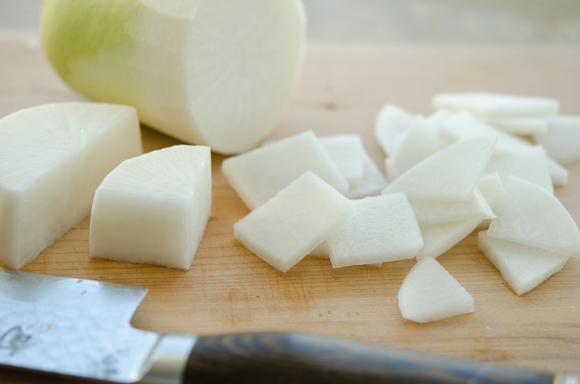 Koreans call the technique of slicing vegetables to a thin squarish shape “nabak-nabak”. Don’t you just love the way it sounds? nabak-nabak? It is fairly simple to make and tastes wonderful. Just by looking at the picture of my Nabak kimchi makes my mouth water because my brain remembers how it tastes. If you have some leftover cabbage and small piece of Korean radish you can whip this up quite fast, although you need to let this kimchi ferment for a few days before you eat. You are getting very good source of healthy bacteria without much heat. And this kimchi brings light and refreshing flavor, it often accompanies to heavy main course in Korean feast. For the cabbage, I suggest to use more yellowish tender parts of cabbage such as cabbage heart about 15-16 cabbage leaves. 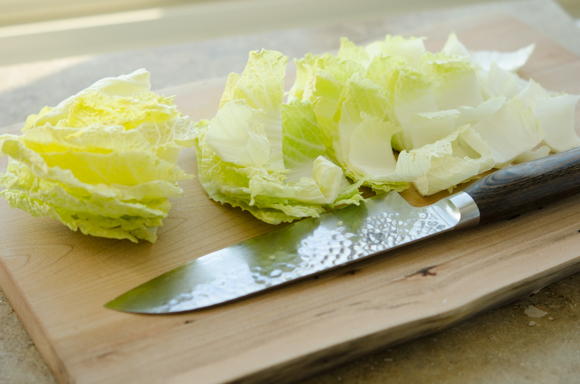 Slice into 1″ pieces but discard the bottom end (4-5 inches) of leafy part of cabbage. Slice your radish in nabak style, about 1″ size with 1/8″ thickness. Can you manage that? 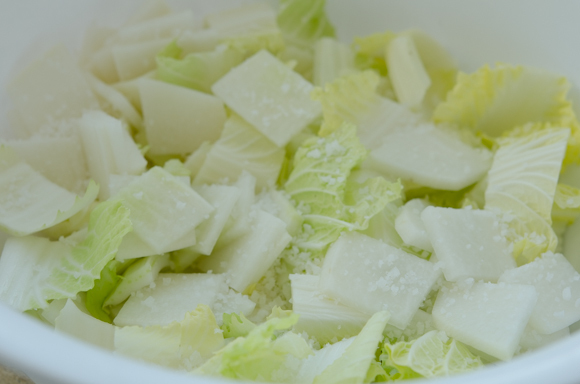 Combine the cabbage and radish in a bowl and sprinkle 1 tablespoon salt over, toss. Let them sit for 30 minutes. Rinse once and place in a large container. 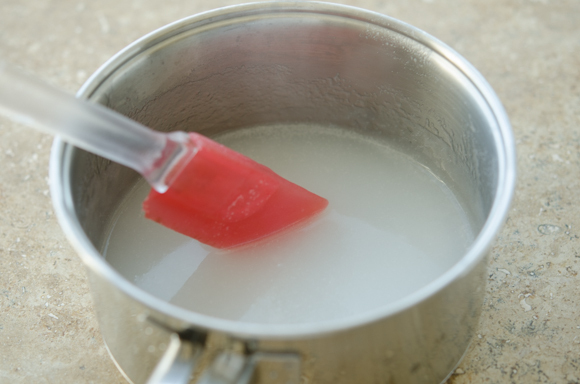 Meanwhile make thin rice glue: whisk in 1 tablespoon of sweet rice flour with 1 cup of water. Bring it to gentle boil and cook until it thickens, about 3-5 minutes. Remove from the heat and let it cool. Dice onion and Asian pear into chunks. Peel garlic and ginger. 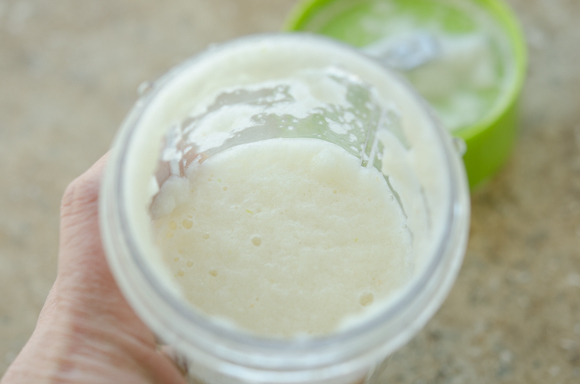 Combine onion, pear, garlic, and ginger in a blender and puree until very smooth. In a small mixing bowl, mix chili flakes, the onion puree mixture, and the rice glue. and twist to strain the juice. This step will get rid of the fibers from the onion and the pear, and yield smoother and cleaner kimchi broth later on. 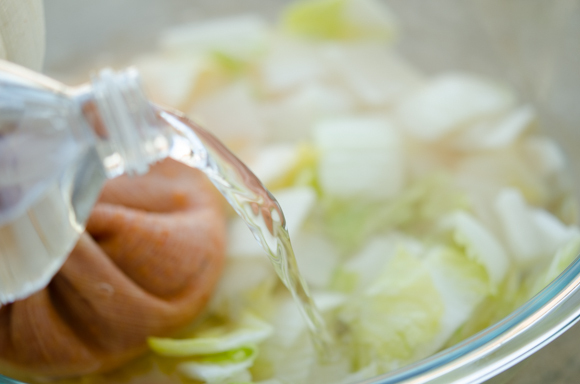 Pour the juice over the cabbage and radish mixture in a container. Or you can tie with a string and add to the cabbage and the radish directly. 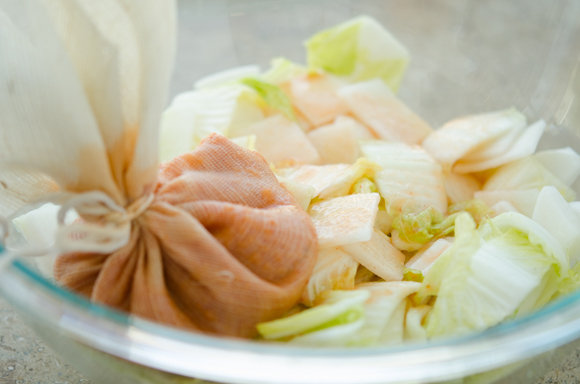 The mixture inside the sash will continue to ooze the juice out as the kimchi ferments. Pour 1 liter of water to the mixture. I highly suggest to use mineral spring water rather than tap water for this recipe. Because water is an important ingredient in this kimchi and you want to use good drinking water to make the difference. Cover with a lid and let this kimchi to sit on the room temperature for 2 days, then store in the fridge for at least 3 days. Basically you can enjoy the pungent yet refreshing flavor of this water kimchi about five days after. The cabbage and the radish will stay crisp all the way to the end and the kimchi broth is something that makes your mouth water. Serve this kimchi as a side dish or along with many types of Korean BBQ. It will brighten up your taste palette. Another way to enjoy this kimchi is serving with simple vermicelli. Simply cook the noodles, rinse out with cold water, then pour over this nabak kimchi and mix together to serve. It makes a wonderful light meal. 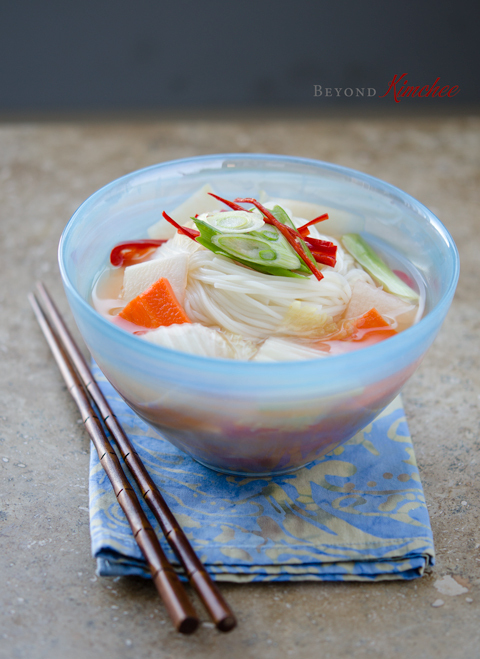 I made the cold noodle soup with nabak kimchi for a quick lunch for myself and it was delish! I can definitely see how refreshing it will be during the hot summer season. Hope you get to try it. Slice the cabbage leaves into 1" slices discarding the bottom 4-5" of leafy parts. Cut the thick whte stem parts in half, if needed. Slice the radish into about 1" square with 1/8" thickness. Combine the cabbage and the radish in a large bowl and sprinkle salt over and toss. Let it sit for 25-30 minutes. Rinse once and drain. Set aside. Meanwhile mix sweet rice flour with 1 cup of water in a small sauce pan and bring it to boil, and simmer for 2-3 minutes to thicken. Let it cool. 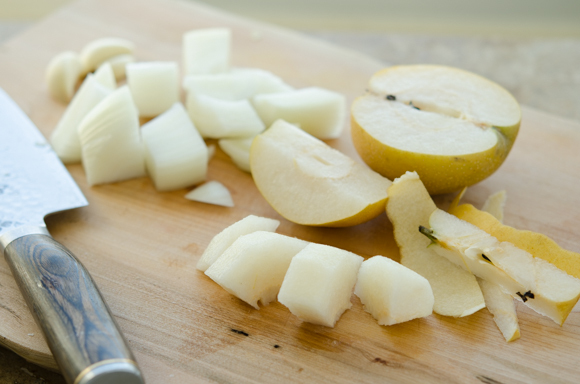 Combine the onion, garlic, and pear in a blender and process until very smooth. Transfer the puree into a mixing bowl. Add pureed ginger, Korean chili flakes and the rice glue. Stir well. 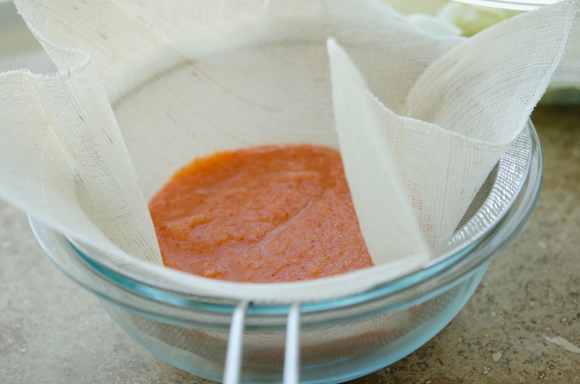 Line a linen fabric over bowl and pour the chili mixture to the center of the fabric. Gather up the faric and tie with a string tightly. In a large container put the cabbage and radish mixture, add the carrot, green onion, and the red chili. Place the chili sash in one corner of the container with a string hanging over, pour the spring water over in the container and toss well. Gently squeeze the sash to release the juice out of the chili mixture. 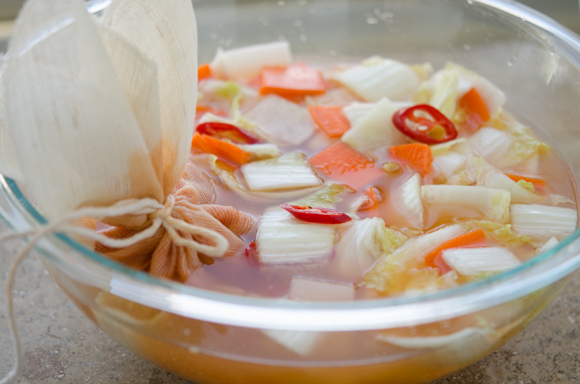 Season the kimchi broth with salt to your taste. 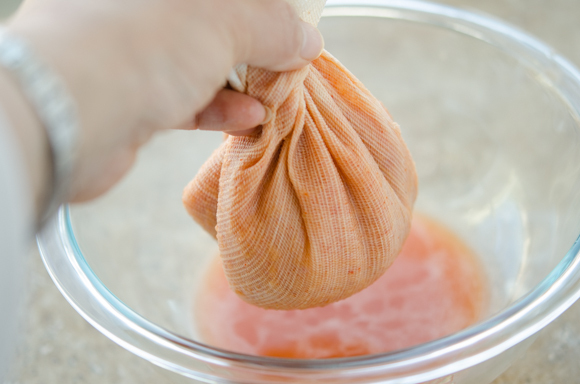 Cover and let it sit in a room temperature for 2 days to ferment first, then keep in the fridge for 3 days before you enjoy. Ohhhhh yes!!!! 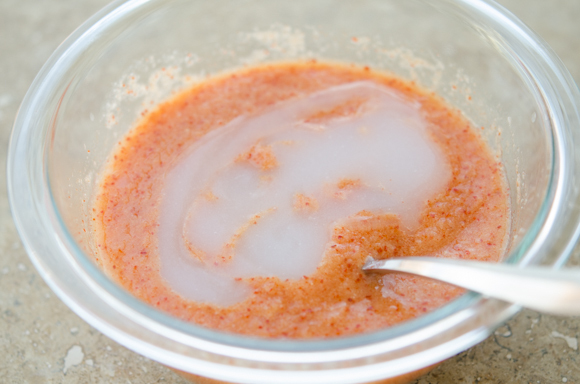 I remember having this "water kimchi" on a hot Summer afternoon when my mother used to put noodles or leftover rice with this water kimchi with a bit of sesame seed oil!! Most refreshing and absolutely delicious. Thanks Holly for allowing me to remember my childhood in Korea. We left Korea 50 years ago and I still remember having this great refreshing and delicious lunch my mother used to prepare for us. I'm definitely going to make it! Hi Adela Glad that this kimchi brought the childhood memory back to you. It is refreshing to serve with noodles. Hope you get to try this recipe. 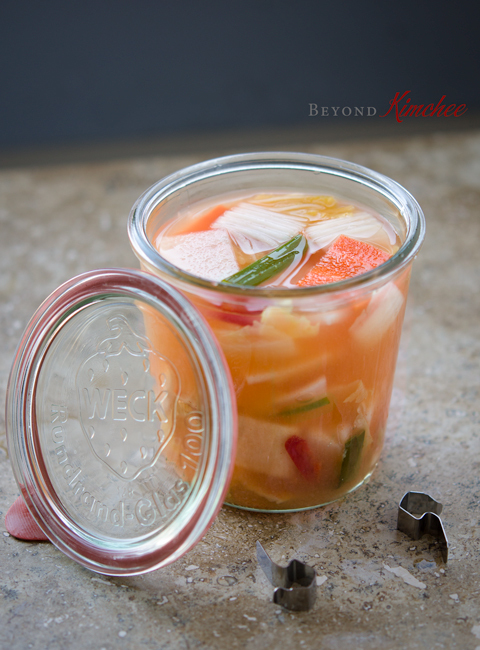 Can I store napa and radish Kimchi in canning jars after they have fermented? Of course. But keep the jars in the fridge. Such a great recipe! I love all things kimchi, and this is an interesting variation. And it must be an awful lot of fun to say nabak-nabak! one of my favorite kimchis. . love this! I'm going to try this recipe! Mmmmm! Beautiful. You make it look so easy. I'm so scared to make kimchee. I usually buy it. I really want to try and make this. Thank you for sharing. Hi Holly- I really enjoy your blog. My mother is Korean and has always fed us kimchee and other tasty Korean foods. She has put an American twist on some things, using what was available to her. Though my mother never made this type of kimchee for us, I am looking forward to sharing this recipe with my sister and trying it. We both have made our own kimchee and other Korean foods. We are certainly not like native cooks, by any means, but we do enjoy the few dishes we have under our belts. Thanks for sharing this! No, I had never heard of it until reading your post! I'd love to try, and oh your pictures are so gorgeous!!! I have never tried watery kimchi, but I am DYING to try!! This looks SO good! I absolutely love Kimchi - fell in love with it when I was pregnant and love it even more now. Fab looking recipe. I think the recipe itself can serve 20 people as a side dish. That should be fine. As long as you put a whole batch of anchovies. Are you talking about the dried anchovies, btw? Here in Sweden I can only find long pink/white radishes that are seasonal now. I know it’s not the same but do you think they could work in this?